For years I’ve steered clear of reading any of Val McDermid‘˜s books and the reason is that I can’t stand to watch the violence and torture scenes in TV series such as Wire in the Blood, based on her Tony Hill/Carol Jordan series. But then I thought that maybe I wasn’t being fair to judge a writer’s work on films based on the books, and I read Cleanskin, one of the Quick Reads series, aimed at ‘adults who’ve stopped reading or find reading tough, and for regular readers who want a short, fast read.’ I enjoyed it and I’ve been meaning to read one of her full length books ever since. 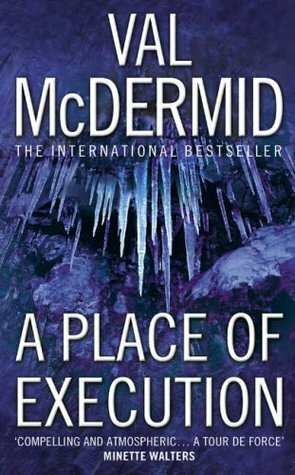 There are many to choose from but I decided to read A Place of Execution, one of her standalone books. The book was made into a 3-part TV drama shown on ITV 1 in 2008, which I didn’t see. It is one of my TBRs. In the Peak District village of Scarsdale, thirteen-year-old girls didn’t just run away. So when Alison Carter vanished in the winter of ’63, everyone knew it was a murder. Catherine Heathcote remembers the case well. A child herself when Alison vanished, decades on she still recalls the sense of fear as parents kept their children close, terrified of strangers. Now a journalist, she persuades DI George Bennett to speak of the hunt for Alison, the tantalising leads and harrowing dead ends. But when a fresh lead emerges, Bennett tries to stop the story ‘“ plunging Catherine into a world of buried secrets and revelations. This is an excellent psychological thriller, full of tension and suspense, set in the Derbyshire village of Scardale, an isolated community of about ten houses, where everyone is related, a place that had a reputation of being a law unto itself. So everyone could tell Detective Inspector George Bennett the time that Alison Carter left home taking her dog for a walk. But despite extensive searches her body is never found, although they do find her dog in the woodland, tied to a tree with elastoplast wound round its muzzle. A Place of Execution spans the years from 1963 when Alison went missing up to 1998 when Catherine Heathcote, a journalist decided to write a book about the case. It had Bennett’s first major investigation and he’d been determined to find out what had happened to Alison. The majority of the book is about his investigation and the meticulous searches he and his team carried out until the case was resolved. But why in 1998 after going over the details of the case with Catherine did he suddenly write to her begging her to abandon the book? The sense of place and time is so well done in this book and the characterisation is so good that I felt I knew these people. Even when the case appears to have been resolved there is something more, something hidden that still needs to be revealed. I had an inkling about what it was but I had by no means guessed all of it. But the clues were all there. There are many layers in A Place of Execution. The villagers are a close-knit community suspicious of outsiders and reluctant to talk to the police. I realised towards the end of the book that the way that Val McDermid has structured the book allows for a great deal of deception and that things are not always what they seem. I loved it and I shall definitely be reading more of her books. I saw the TV adaptation first and quite enjoyed it. I then read the book and loved it. And I do like Wire in the Blood and have read several of the Hill/Jordan books. I’m wanting to read some of McDermid’s new series, Karen Pirie. I’ve heard it’s good too. McDermid really is good at ramping up the tension, isn’t she, Margaret? I’m glad you found this one so enjoyable. And I agree about violence: i prefer to avoid a lot of brutal violence and torture scenes in my reading, too.